Drownings in the river were then not infrequent, and the Glasgow Humane Society awarded a guinea for every case of successful rescue, until it was discovered that some drunken fellows were in the habit of getting up mock strugglings in the water, for the sake of the guinea which they were always at hand to earn! A winding and silvery stream was the Clyde in those days, with emerald banks feathered here and there with broom. One morning at an early hour I observed a fisherman draw his net at Govan, and land a salmon of such beauty and proportions as would have delighted the heart of Thomas Stoddart or “Christopher North”. Govan, with its handsome church and spire among the trees, was likened to Stratford-on-Avon. I knew a family who took a house there for country quarters. But what a change have the Cyclops of Coatbridge and Gartsherrie brought about! The Clyde has been straightened and widened and deepened into the semblance of a huge ship canal. Govan has been swallowed up and amalgamated. The little harbour itself has grown into miles and acres of quays, docks, shipbuilding yards, and engine-works. Masts, funnels and ferry boats — cabs, clerks, lorries, stevedores, and miscellaneous crowds — make up an extraordinary and perpetual scene of mercantile animation. The river has become something wonderful, but its charms are no longer idyllic; and I can understand how the poet Campbell, on revisiting that locality of his green and happy memories, should have exclaimed with saddened emotion . . .
At this epoch of the world, indeed, poetry and sentiment, and the loveliness of nature itselfr, must give place to the vulgar utilities. When Henry Bell put forth his tiny Comet, he introduced a distinctly new area in the progress of mankind. He was not, it is true, the inventor of the steamboat. Symington and Taylor, with the aid of Mr Miller of Dalswinton — a fine old gentleman whom I once met — had made their momentous experiments on Dalswinton Loch. Fulton carried the knowledge of these to America, where he anticipated the triumph of Bell. It is difficult to place the laurel on precisely the right brow. The glory of steam navigation I believe to be chiefly attributable to James Watt. He it was who took the wild vapour born of fire and water, threw it over the lasso of exquisite mechanical contrivance, and sent it forth into the world on its stupendous mission. The application of the newly mastered force to navigation, as afterwards to land travel, was inevitable. Whoever might take the initiative, the steamboat as a matter of fact was due. 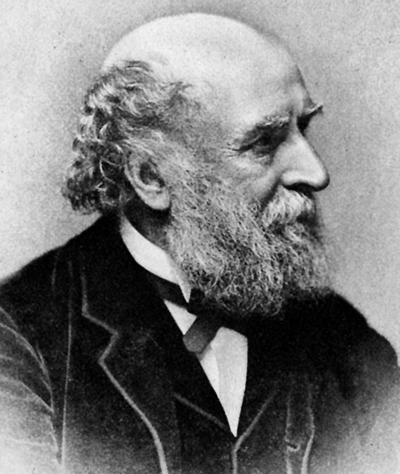 Yet, when all is said, the merit belongs to Henry Bell of having been the first to place a practicable steamer on British waters, and thus to pioneer the way to the astounding steamship industry which has bridged over all seas, and built up the colossal navies which are a protection and a terror to the nations. What I may call his little Clyde experiment was the precursor of the ‘Cunarders’ and ‘Anchor Liners’ which have made the transit of the Atlantic a pleasure-trip; but these grander results of his achievement he did not live to witness. 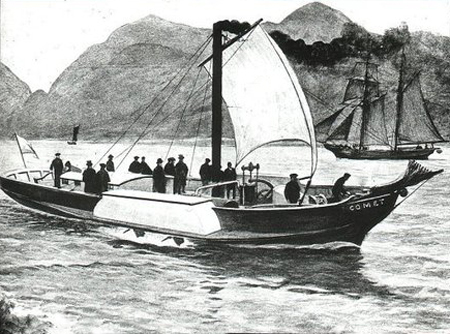 Most of the immediate successors of the Comet were inconsiderable craft plying to the scattered watering-places on the Firth — Gourock, Dunoon, Largs, Rothesay, and the rest — and it was while going coastward in one of these that my attention was directed to a little man on deck, who wore a long greatcoat of blue serge, and whose face beamed with intelligence. This was no other than Henry Bell himself. He travelled in all steamers free, and had a pension from the Clyde Trust. Perhaps I then regarded him as a great original inventor, but in any case I could not be wrong in viewing him with interest. Both ingenuity and enterprise he must have possessed in no ordinary degree, and he must also have been largely endowed with tact and foresight to seize and shape to his purposes a transcendent opportunity. Two granite obelisks bearing his name — at Dunglass, and at Helensburgh where Bell lived and died — now look out upon the waters which he helped to make famous; nor will any man grudge these tributes to one who has contrived to associate himself in so remarkable a way with the material progress of his race. This article is a chapter from 'Backward Glances', an 1891 book written by Helensburgh man James Hedderwick, who was the proprietor and editor of the Glasgow Evening Citizen for many years in the 19th century.